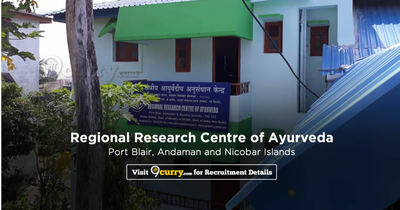 RRCA Port Blair Recruitment 2019 - Below are various recruitment notifications published by Regional Research Centre of Ayurveda (RRCA), Port Blair. As of now, we don't have any active recruitment notification by RRCA Port Blair featured here. We may update as soon as the organization announces a new job notification. If you are looking for any information related to previously organized recruitment drives by RRCA Port Blair, you can browse through previous job notifications mentioned below and get the new updates or information you are looking for. RRCA Port Blair Recruitment 2019 - Job notification for Multi Tasking Attendant Post on a project entitled “Tribal Health Care Research Project (Covering A&N Island State)” in RRCA Port Blair , Andaman & Nicobar Islands. Applications are invited by RRCA Port Blair on or before 23 Feb 2019 05:00 PM for 1 vacancy. 1 (a) Matriculation or equivalent pass from a recognized board. (c) Should have good communication, writing ability & interpersonal skill. On the basis of written test/skill test/interview .